Happy Valentine’s Day! 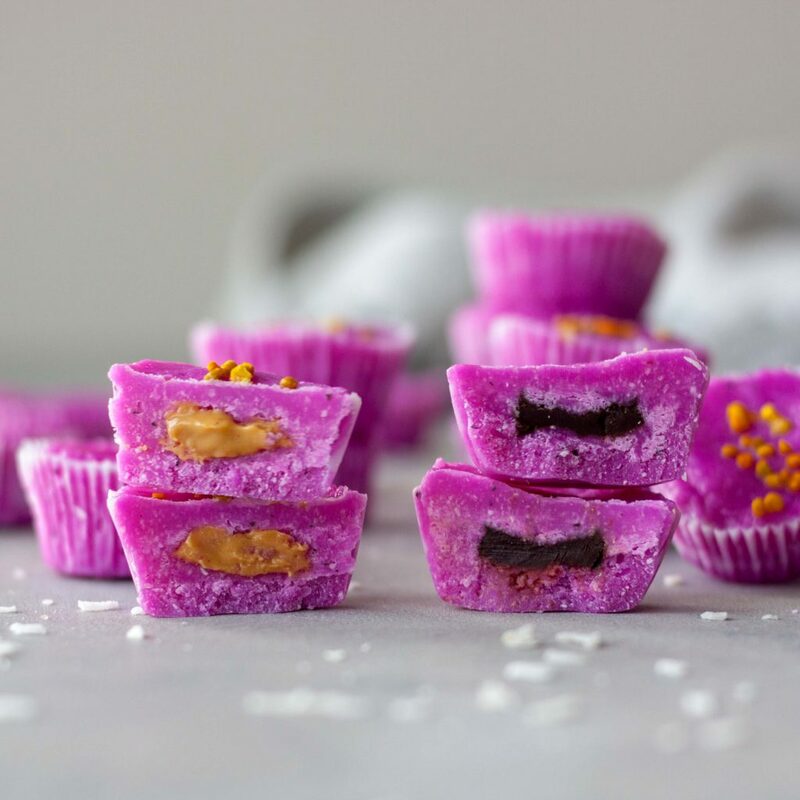 A day full of love and sweets seemed like the perfect day to share my Pitaya Coconut Peanut Butter Cups. So quick and easy you can still make them for your Valentine, or just keep them all yourself! 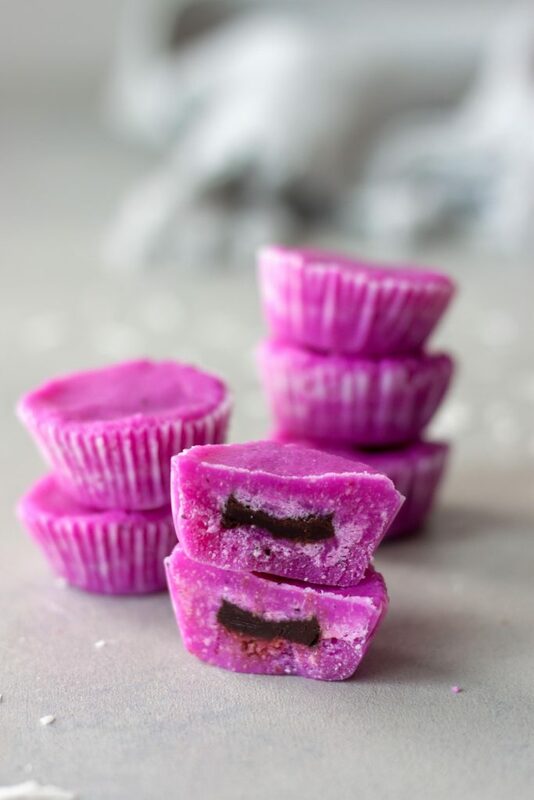 A pretty pink twist on my Vanilla Bean Coconut Butter Vanilla Almond Butter Cups I shared almost 4 years ago. I know a long name I didn’t think much about back then I guess. I’ve been making these a lot recently and I was going to share them this spring but thought they were perfect for today. Of course trying to whip out another batch to photograph they didn’t turn out as perfectly smooth as previous batches but I decided to go with it because they don’t have to be perfect to taste good and it’s real life. The more pitaya you add the brighter the color but the mixture isn’t as smooth and creamy. I went for really bright so my mixture had to be pressed in the cups rather then poured, it just depends on how much pitaya is added and what you’re going for. Just like the amount of nut butter which I didn’t add as much as I normally do this time. I’ve also played with adding MCT oil in place of the coconut oil and recently added brain octane oil. 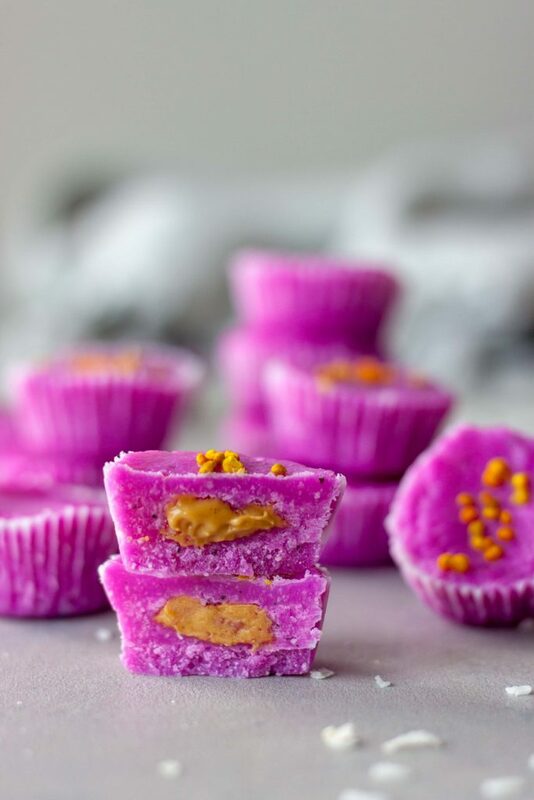 With only 4 simple ingredients, unsweetened shredded coconut, liquid sweetener like honey or agave, frozen pitaya, and nut butter. Frozen pitaya is also called dragon fruit and is sold at many local grocery stores. If you cannot fit it you could probably sub raspberries for color if desired or omit it to make Vanilla Bean Coconut Butter Vanilla Almond Butter Cups. Coconut is high in fiber and healthy fats, low in carbs and sugar, and packed with vitamins and minerals. Did you know that coconut also contains protein? Not a lot but still many find it surprising. Coconut oil or MCT oil, although there isn’t much in the overall recipe. Pitaya, dragon fruit, is rich in antioxidants, magnesium, iron, vitamin B2 and vitamin C. It’s also high in fiber. Although only a little pitaya is used in these cups. My favorite way to enjoy it is in a smoothie or smoothie bowl but it doesn’t stop me from using it in treats like these and donuts I made last weekend! 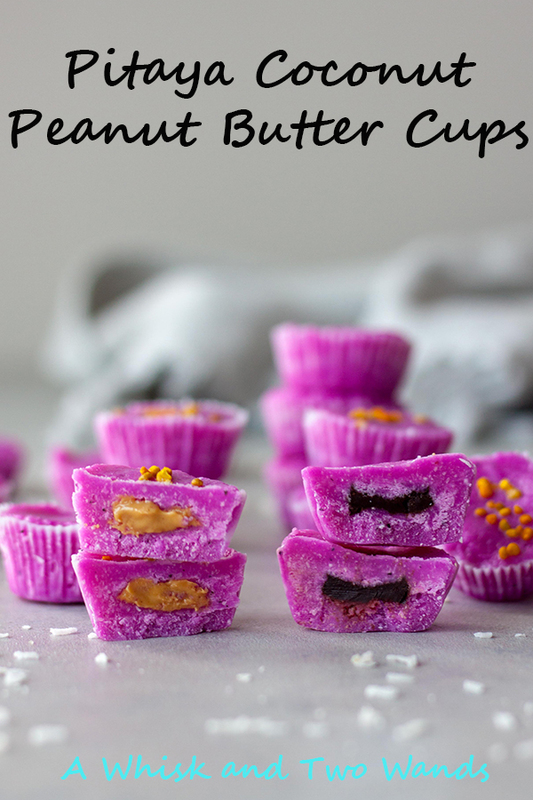 Almond butter would be the healthiest option to use for filling but I like peanut butter and it’s all about moderation and these are still a healthier treat when made with peanut butter or the chocolate hazelnut spread I used. Low in sugar and carbs, full of healthy fats and fiber they are a healthier treat I can’t stop eating. They are gluten free, dairy free, vegan friendly (depending on sweetener used), and paleo friendly (sub almond butter). I think maybe even Whole 30 if you leave out the sweetener, although I can’t say how they’d taste as I haven’t tried them without a little added sweetener. While I love chocolate there is something about these coconut butter cups I crave lately. Not sure if it’s the simple coconut flavor, lower sugar, or healthy energy I seem to get from eating them. Plus they’re filling so one in the afternoon is perfect for those sweet cravings. Wanting chocolate I fill them with Dark Chocolate Chocmeister, a healthier chocolate hazelnut spread with lower sugar and more protein that tastes delicious. Otherwise I fill them with smooth creamy peanut butter! If you like coconut you will probably love these cups. I’ve got a few left in the fridge to enjoy today but I think I’ll be making a pretty pink pitaya smoothie bowl today too! Then we have a busy night so no “fancy” homemade dinner this year. What are you doing for Valentine’s Day? Pitaya Coconut Peanut Butter Cups are simple (only 4 ingredients) and easy to make, healthy, and delicious! 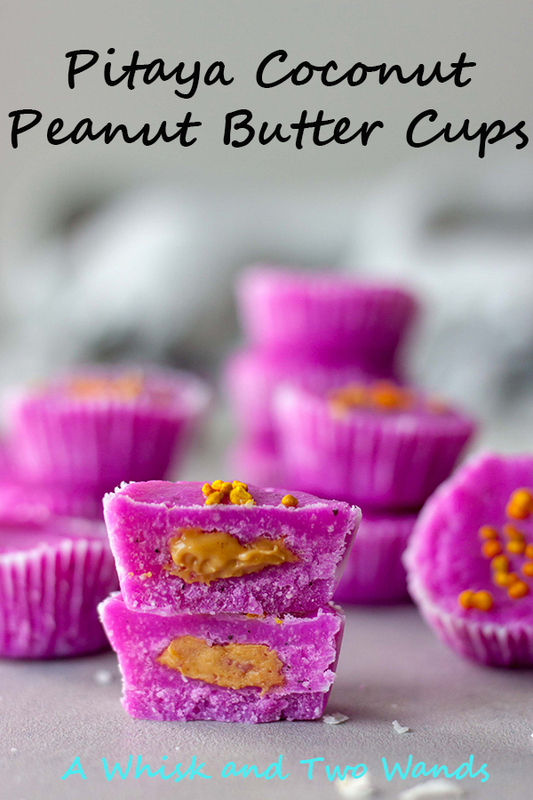 Packed with healthy fat and fiber, low in sugar and carbs, they are gluten free, vegan, and paleo friendly as you can fill they with endless nut butter options. Place nut butter in a pastry bag or ziploc bag with the corner cut. Add in sweetener and pitaya. Stream in coconut oil and blend just until well combine. Fill each cup about 1/4 of the way up with the pitaya coconut butter (about 1 teaspoon per cup). If you added more pitaya, or depending on sweetener, and the mixture isn't smooth and pourable you will have to press it into the cups. Pipe in nut butter in the center of each cup. Top with pitaya coconut butter to cover. Store remaining cups in an airtight container in the refrigerator. Enjoy! Used almost 1/4 of a cup of nut butter, add more if desired. How much I add depends on the nut butter and my mood at the time. Thank you! Hope you enjoy them as much as we do. We have another great filling idea for our next batch we can’t wait to share with you!